Click on the links below to learn more about these great opportunities. New! BSCAH Opportunity Youth Program – Are you between 16 & 24? Are you out of school? Are you looking for employment? Need a place to develop your skills? BSCAH’s Youth Workforce Development Program offers young people the opportunity to get paid while you learn, get prepared for the workforce, get resume writing, communication and interview skill, plus a spot on a great team where you will get all the support you need to move forward with your career. The next cycle starts March 4, 2019. For more information, contact Sam Pinn, Program Resource Manager at spinn@bedstuyagainsthunger.org or Johnny Futch, Programs Assistant, at jfutch@bedstuyagainsthunger.org. 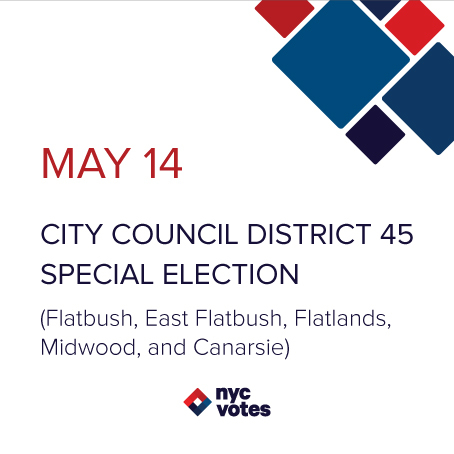 Call 718.773.3551 ext 116/117 with any questions. Click here to view the program flyer. Brooklyn Job Corps Academy: Students receive the skills needed to succeed in today’s workforce – at no cost to them or their families! If you are looking for a better quality of life and are willing to dedicate yourself to our life changing program, Brooklyn Job Corps is the place for you! Young people interested in joining Job Corps are invited to visit the Job Corps Recruiting Web site or call (800) 733-JOBS today! Business Careers Exploring program: This program is open to young people, ages 14-21, with an interest in learning more about careers in the field of Business. Business Exploring is a hands-on program that exposes participants to many of the major functional areas within a business including Sales/Marketing, Operations, Finance/Accounting, Customer Service, Human Resources, and Information Technology. Center for Employment Opportunities: CEO offers comprehensive employment services exclusively for people with criminal records, with an emphasis on providing services to Young Adults ages 18-25. Center for Family Life Youth Employment Program: The Youth Employment Program (YEP) encourages skill development, supports career and educational goals, increases civic engagement and provides a creative and supportive environment for young people. Monthly stipends are offered for high school participants in WAVE, Rise-On, CAP, SEEK and Step-Up. Clerical Skills Training & GED Support (Ages 17-24) - This paid 20-week training program includes Business administrative/customer service skills; Public speaking and communications skills; College access assistance; Job placement assistance; High School Equivalency (HSE) preparation; Networking w/ corporate executives.The program also includes a biweekly stipend and a free metrocard. Click here to see the program flyer. For more information visit www.obtjobs.org or email outreach@obtjobs.org or call 718-369-0303. Community Organizer Apprenticeship Program – The Center for Neighborhood Leadership trains the next generation of community leaders and increases the capacity of grassroots organizations to win concrete changes for communities. The Organizing Apprenticeship is a rigorous ten month, five day per week training and educational program. Apprentices spend four days per week working at a host site, and one day per week in training. The Apprenticeship is conducted in partnership with Public Allies New York (PANY). Apprentices are paid a total of $17,000 and contribute 1,700 hours of service for the ten months. Candidates who speak Spanish, are ages 17-24, and do NOT have college degrees are especially encouraged to apply. For more information, click here to view the application, visit the website or contact Ericka Stallings at ericka.s@anhd.org. Coney Island’s Luna Park is hiring for Summer 2019! Looking for an opportunity to work at the largest theme park in NYC? Luna Park has many exciting opportunities whether you want to work behind the scenes or right in the middle of the action. View all the positions Luna Park has to offer by clicking here and begin a wonderful new journey. Decorative Arts Training for People with Disabilities – The Alpha Workshops Studio School provides free training in the decorative arts to students who are HIVor who are disabled. Students learn extensive painting techniques including gilding with metal leaf; understanding of color and paints; glazing techniques; troweled finishes; and how to transfer designs onto walls for painting, and more. The curriculum is done in two parts – an “Introduction to Decorative Arts Technique” which is ten weeks long, three days per week (from 9:30am to 5:00pm). If the student does well in this course, they are invited to take the advanced course which is 26 weeks long, three days a week (9:30am-5:00pm) and includes a work readiness component to prepare students for entry level work in decorative paining. The program is free for all students and there are also stipends which are provided to help with transportation to and from school. For more information, click here to see program flyer, visit the program website at www.alphaworkshops.org or contact Alpha Workshops Studio School Director Leisa “Doc” Herrera at (212) 594-7320, ext. 24 or email leisa@alphaworkshops.org. DYCD Youth Job, Volunteer, Intership & Scholarship List: DYCD has created a list (http://bit.ly/YouthJob) of employment and volunteer opportunities, internships, scholarships and other resources for New York City youth 16 and up. Earn $1550 in 10 weeks + Job Training! Are you between 17-24 years old and not currently enrolled in school? The Out of School Youth (OSY) program is offering 10 weeks of paid training & customer service certification. To find out more, click here to see program flyer or contact the Italian American Civil Rights League at 718-642-2180. 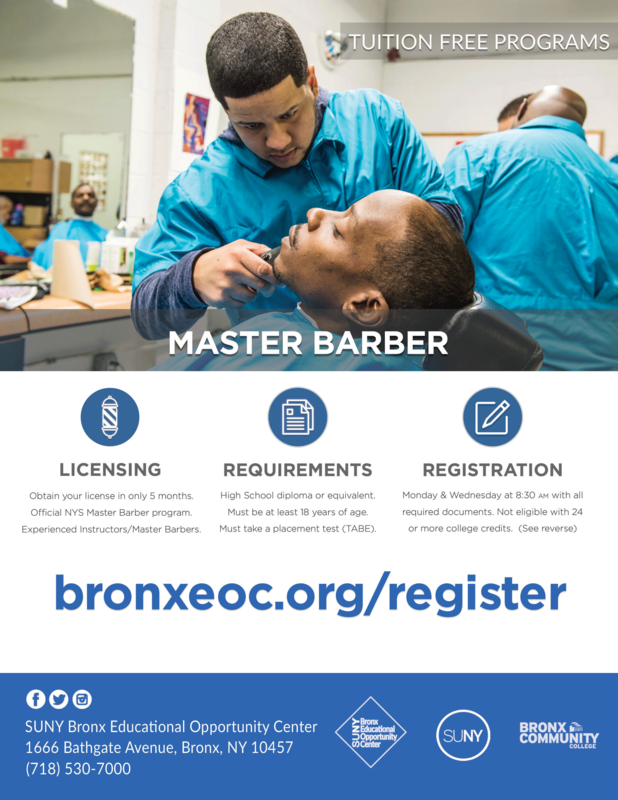 FREE Master Barber Program - SUNY/BEOC: Youth are encouraged to sign up for the FREE SUNY/Bronx Educational Opportunity Center Master Barber Licensing Program. The Master Barber Program is a 500-hour program to prepare adult students for the official New York State Licensing Master Barber Exam. Instructions include theory and as well as modules to assist the students in signing up for the official state licensing practical exam, job placement assistance and information on how to start their own businesses. The program is generally 20 weeks, Monday through Thursday from 9:00 am to 4:00 pm. (Subject to change) TABE Scores required are: Reading 8.5 – Math 7.0. Click on this link for more. Registration takes place every Monday and Wednesday starting at 8:30 a.m. (Closed on holidays) with the Required Documents. LaGuardia Community College Justice Community Program: LaGuardia Community College’s Justice Community Program offers community benefit projects and civic engagement, transferable job skills to help build an individual’s resume, career counseling, job readiness workshops, mentoring and leadership opportunities, and a chance to earn up to $300 a month and metro cards for achieving program goals ($1,350 max). In order to qualify an individual must: be between the ages of 16-24, have had some type of criminal involvement within the past year/an individual who is at risk of having criminal involvement, and someone who is on probation/parole. All interested parties should contact Vanessa Jarvis at 718-482-5171 or vjarvis@lagcc.cuny.edu. Laptops, Workshops & Job Readiness Skills @ at eight branches of the Brooklyn Public Library in Bushwick, Bedford-Stuyvesant and Brownsville. All for free! Click for more information. Law Enforcement Explorers Programs: Law Enforcement Exploring is a community service, career-oriented program designed to educate young men and women, ages 14-20, about Law Enforcement. Agencies including the FBI, DEA, U.S. Customs Service, NYPD, NYS-MTA Police, AMTRAK Police, NYC Department of Correction, New York State Police and U.S. Secret Service sponsor programs, participate in the Law Enforcement Academy and make their agents and facilities available for training. Line Cook Training Program – Stage NYC is a FREE 12-week culinary training program designed to meet the growing demand for qualified kitchen employees in New York City’s restaurants while simultaneously increasing access for young adults looking to start their careers in the culinary arts. Stage NYC is seeking applicants ages 18-24 years old (but anyone over age 18 is encouraged to apply.) Participants will gain the technical skills, industry exposure and paid on-the-job training experience with various restaurant employers, necessary to launch and grow rewarding careers as line cooks in the hospitality industry. During the on-the-job training portion of StageNYC participants will be paid by their host restaurant. While not guaranteed, this position does have the possibility to turn into full-time work after the training. Applicants must be at least 18 years of age and live in New York City. Apply today! Click here to visit website for more information and to apply. Medical Information Technology Training Program: This program, presented by STRIVE, is open to Young Adults, ages 18-24, who have either a high school diploma or a GED. This program is free and carfare is provided once participant has begun training! For more information, contact STRIVE, located at 240 east 123rd Street (3rd floor) by calling (212) 360-1100. Ask for program coordinator Teresa Diaz, Davil Jackson, or Emmanuel Pacheco. Click Here to see the program flyer. No Kidding – The Human Resources Administration’s No Kidding: Straight Talk from Teen Parents program brings real teen moms and dads to schools throughout New York City to talk about the difficult experience of raising a child, and to encourage teens to wait until they are financially stable adults to have children. To become a peer educator, you must be a loving and committed parent between the ages of 18-20, available to work at least 32 hours per week with an outgoing personality and good interpersonal skills. The position of Peer Educator pays up to $17/hour plus you will receive specialized training and support. You do not have to be living with your child to qualify. Email Lisa Rosario at lisa.rosario@dfa.state.ny.us to apply. NPower offers FREE Technology Training and Career Development for NYC Young Adults (ages 18-25.) Apply today for a free 22-week, intensive IT training program designed for underserved young adults who have earned a GED or high school diploma. Cisco Networking Academy’s IT Essentials curriculum includes hardware, software, server and networking. Morning or afternoon classes are available. Students will have the opportunity to learn from senior IT industry executives, participate in a seven week internship, earn a CompTIA A+ Certification & benefit from post-program employment opportunities and continued learning services. For more information, visit npower.org/technologyservicecorps, email AdmissionsBrooklyn@npower.org or call 347-415-8830/8832. Click here to see program flyer! NYC’s Summer Youth Employment Program (SYEP) will be accepting applications in March 2019! SYEP provides New York City youth between the ages of 14 and 24 with paid summer employment for up to six weeks in July and August. Participants work in a entry-level jobs in a variety of exciting industries. Youth can apply for the program online, at a community-based organization during the application period or at CB14′s 12th Annual Youth Conference on March 14th at the Brooklyn College Student Center. Participants are selected by lottery for the program. For more information, call 311 or DYCD Youth Connect at 1-800-246-4646. The application deadline will be in mid-April 2019. Opportunities for a Better Tomorrow: The mission of Opportunities for a Better Tomorrow (OBT) is to help disadvantaged youth and adults recognize their own self-worth, and advance towards self-sufficiency and financial security through job training, academic reinforcement, improved life skills, job placement, and support services. OBT offers several programs for young people including Youth Employment Training & TASC which includes class instruction in Business English, Business Math, Keyboarding, Office Procedures, Computer Training, Public Speaking & Communication (2 hours/week), and World of Work. Pre-GED and GED (TASC) classes are taught on-site at Bushwick or Sunset Park locations by NYC Department of Education (District 79) teachers. Tutoring is available for youth who are in need of extra preparation. Each participant is assigned to a supervisor (counselor) who monitors the trainee’s progress and offers one-on-one assistance with personal, educational, and career problems. OBT also offers the Young Adult Internship program (YAIP) to young people, ages 17-24. Young people selected for the YAIP internship program will increase work experience, enhance professional skills and make $2,800 in 14 weeks! Interested candidates can contact the YAIP Youth Coordinator Alexandria Bellivan directly at 718-387-1600 or via email abellivan@obtjobs.orgFor general program information, contact OBT at 718-387-1600 or 718-399-9700. 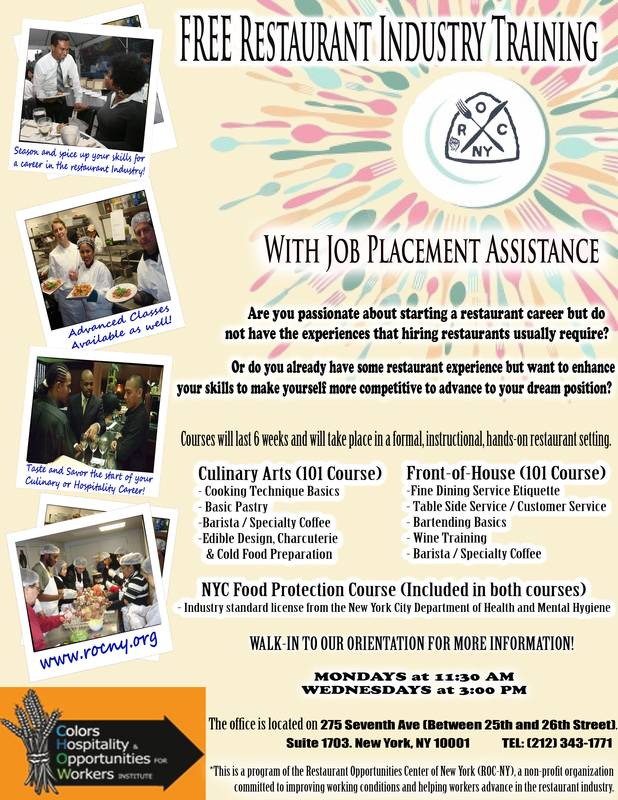 Restaurant Industry Training – The Colors Hospitality and Opportunities for Workers (CHOW) Institute, a program of ROC-NY, offers a FREE 6-week Culinary Arts and Front of the House Restaurant skills training program to New York City residents, including individuals and families with employment barriers (Click to see flyer.) Courses include Basic Cooking, Basic Pastry, Specialty Coffee/Barista, Edible Design & Cold Food Prep, NYC Food Protection Course & Certification, Server Training, Basic Wine Training, Customer Service Training & Basic Bartending Training. Orientations are offered twice a week. Call 212-343-1771 or visit www.rocny.org for more information. Retail & Service Training - This Way Ahead is nine-month program for young adult ages 16-21 who are in school and want to gain job and leadership skills. With a coaching program and the partnership of major businesses (like Gap, Old Navy and Banana Republic), you’ll be setting yourself up for success after high school. To learn more about This Way Ahead, offered by Manhattan-based organization The Door, contact Jiselle Nunez-O’Neal at 212-941-9090, ext. 3332 or by email at jnunez@door.org, or Matthew Hayward at mhayward@door.org. Teen Career Connection (TCC)- The YMCA recognizes many teenagers cannot secure work over the summer. The majority of employment opportunities available to teens oftentimes do very little to build their resumes or skill sets. The West Side YMCA has developed Teen Career Connection to address this need. TCC is an eight-week comprehensive internship program, providing NYC youth an unparalleled opportunity. Teens first go through two weeks of intensive professional development, followed by six weeks of hands-on learning experience at an organization/business matched to the student’s career aspirations. In addition to the training and internship experience, teens get linked to a professional who serves as their mentor, supporting them throughout their time in the program. For more information, click here to visit website or call 212-912-2665 or email Greg Mateo at gmateo@ymcanyc.org. The School of Cooperative Technical Education (Co-op Tech) is accepting Applications for fall! Co-op Tech offers half-day vocational programs for both in and out of school students ages 16-21 years old, with hands on training in a variety of in demand and cutting edge trade areas including Construction, Health, IT & the Service Industry. Co-op Tech attend traditional high schools, Pathways to Graduation programs or may have already graduated from high school. Enrolled Co-op Tech students take part in the Department of Education’s Work Based Learning (WBL) Program and are matched with an internship partner. Some internships are paid. Classes are offered in all five boroughs. For more information, visit Coop Tech’s website at www.co-optech.org or call the Brooklyn campus at (718) 222-6600. Tuition-Free Job Training Program & Paid On-the-Job Training for Women, ages 18-24 – Grace Institute’s Young Adult program offers five months of computer and professional training, one year of job-placement services (with an 80% placement rate), workshops with corporations and executives and more. The program runs Monday – Friday, 9am-4pm. Attend an upcoming open house to tour the classrooms, meet the staff and learn more about the application process. Click here to see program flyer. Visit www.graceinstitute.org to register or send an email to admissions@graceinstitute.org or call 212-832-7605. Open Houses are held at 40 Rector Street, 14th Floor, New York, NY 1000. TV & Film Production Assistant Training Program: 4-week “Made in NY” training program for individuals who want to start a career in TV and film production. Leads to certification by the New York City Mayor’s Office of Film, Theatre and Broadcasting and two years of job placement assistance. Program requirements include: 21 years old or older, NYC Resident, valid driver’s license, unemployed or low income. Contact 718-237-2017 ext. 145. Urban Youth Jobs Program: This program can help you get a job! Plus, you may earn up to $900 to cover your expenses during training. Getting certified for the program is a snap; see the website for details. The NY Urban Youth Jobs Program (formerly NY Youth Works) encourages businesses to hire unemployed, disadvantaged youth. Are you between the ages of 16 & 24. Do you need help finding a job? The Urban Youth Jobs Program can assist you! The goal is to help you get into the workplace and succeed. First, all you have to do is get certified by the NYS Department of Labor. That’s easy. Just click the link & fill out the youth application. Applicants can fax, mail or email in applications for the 2015 Program Year by December 31, 2015. Year Up New York (Recruitment Information Sessions) – Year Up is a PAID one-year, intensive training program that provides low-income young adults, ages 18-24, with a combination of hands-on skills development, coursework eligible for college credit, corporate internships, and wraparound support. Their mission is to close the ”opportunity divide” by providing young adults with the skills, experience, and support that will empower them to reach their potential through professional careers and higher education. Eligibility requirements:18-24 years old, High school graduate or GED recipient, Low to moderate income, U.S. Citizen, permanent resident, or have an employment authorization card, Available 5 days a week (Monday-Friday) for the full year of the program; Highly motivated to learn new technical and professional skills. For more information, Click Here to download program flyer or contact Ryan Overton, Director of Recruitment, Phone: (646) 341-6785; Email: ROverton@YearUp.org. YMCA Jobs (Part & Full-Time positions available) – The YMCA of Greater New York seeks people who want to make a difference and join a team dedicated to empowering youth, improving health and strengthening community across the city. Click here to see available job opportunities at YMCA branches throughout NYC and join over 4,000 people who are working together to make a difference in the communities we serve. Young Adult Internship Program – Apply for a 14 week PAID internship & earn up to $2800! If you are a young person ages 17-24 years old and you are not working, not in school and do not have a college degree, you may qualify for this program. In addition to the paid internship, you can get help with your resume and interview skills, education planning, career exploration, professional communication skills, job search assistance and more. For more information and to schedule an appointment call 212-453-5381 /5392 /5394 / 5366. More infomation is available online at www.nmic.org/yaip. Youth Employment and Education Services: The Isaacs Center helps residents ages 16-24 who are unemployed or underemployed and not currently in school get a job that leads to a career. Services include career counseling, soft skills training, and high school equivalency classes. For more information about applying for the cycle that begins January 6, contact Gina Altano at 212-360-7625 ext.217 or Galtano@Isaacscenter.org. The Stanley M. Isaacs Neighborhood Center (Youth Center) is located at 1792 First Avenue, New York, NY 10128. YouthBuild program – YouthBuild is a program for out-of-school young adults, ages 17-24 years old, who do not have a high school diploma or their High School Equivalency (HSE, formerly known as GED) certification and would like to participate in HSE, Construction and Leadership Development Training. This program offers students the ability to earn your High School Equivalency certification in addition to completing a Home Builders Institute Pre-Apprenticeship Construction Certificate course and a 10-hr. OSHA Construction Safety Course. For more information call Liz at 212-822-8355, Jessica at 212-453-5369 or Edwin at 212-453-5381. Not sure what you want to do for a career? Check out the New York State Department of Labor’s new CareerZone Informational Video Series and online resources including self-assessment tools, resume and applications tools, and more. CareerZone is a great place to explore careers related to your strengths, skills and talents. Get started today by visiting www.careerzone.ny.gov.